Modern advances in dental science now allow us to offer patients multiple options to help you enjoy a functional, secure, confident and beautiful smile — all in our San Francisco office, conveniently located in the financial district of San Francisco, California. 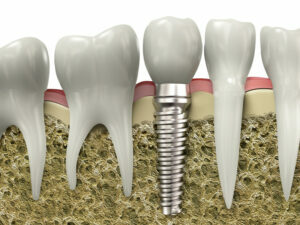 One of the many safe, successful and proven procedures is dental implants. It involves the installation of permanent replacement teeth supported by artificial dental root forms called dental implants. These tooth replacements look, feel and function like natural teeth. Dental implants have solved many problems associated with tooth loss that previously required replacement by removable full or partial dentures. The procedure, referred to as osseo or biointegration, provides patients with the comfort and assurance of permanent teeth. Many of our San Francisco Bay Area dental implant patients find that dental implants restore their self-confidence and self-esteem and improve their quality of life. I’m Looking for Cheap Dental Implants – Is that Really Possible, and What are My Options for Quality?